It is Durian season in Thailand (around April – June). I have seen a lot of Durian everywhere at the markets and street vendors now. 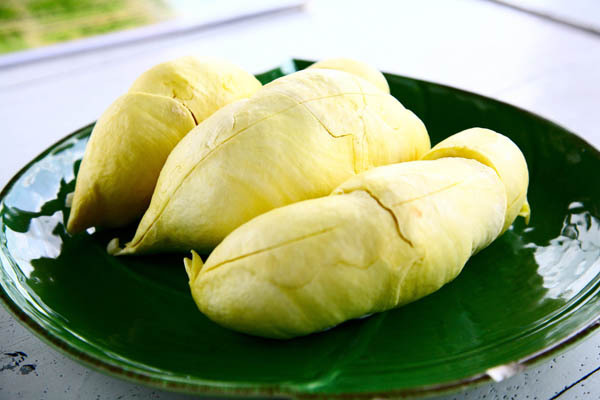 Durian is widely known in southeast Asia as the “king of fruits” (ราชาผลไม้). It is a fruit like no other. 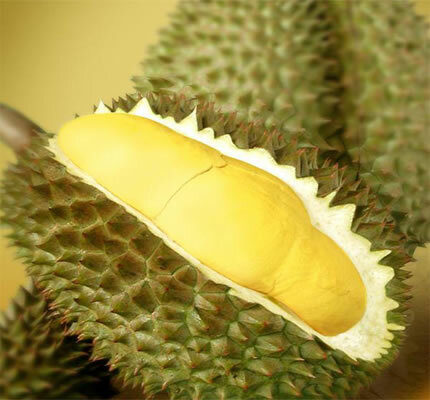 We usually think of fruit as light and fresh, but durian is very rich. I think if you never had it before, you might not believe it is a fruit. It is distinctive for its large size, unique odour, and formidable thorn-covered husk. It stinks, you say? Of course not for me. To durian lovers, its aroma is heavenly and cannot be separated from its divine taste; durian haters think it is has the stench of garlic and onions, and worse yet, of sewer or rotten meat. The fruit itself looks like small golden pillows, and it has the sweet custardy taste to them. I think perhaps the smell and taste of durian is an “Asian thing” saturated in our genes from generations of exposure to the fruit. My mom is the biggest fan of Durian, I always had to stop her from having too much of it. Durian is available in many forms. If you don’t like fresh Durian, you might like to try durian chips (ทุเรียนทอดกรอบ), durian paste (ทุเรียนกวน), durian ice cream (ไอศครีมทุเรียน) or durian with sweet sticky rice and coconut milk (ข้าวเหนียวทุเรียน). Personally, I only eat fresh durian, I don’t know why I am not a big fan of other durian produces. Fun Fact: Durian is the only fruit that tigers will eat. Are you a durian lover or hater? Any advice on how to pick durian at the market? Sawatdee ka Emily, Usually the seller use their finger to flick the durian shell and listen to the sound, if it sounds like there is a hollow inside that means it is ripe. I don’t know how to do that actually, I usually ask the seller to pick it for me. awesome blog you have here, congrats and please keep up the great work! I started learning Thai and although I have some problem with pronouncing some words (especially when ng are together) I find it a fascinating language and want to learn asap. for now Rien ngoo ngoo, plah, plah. Hi there, Yes I am using WordPress. I don’t need any html knowledge to create my blog. I got a little help from a friend at the beginning to set it up though. Sorry I can’t help much. I got a lot of these spam messages on my blog http://imperialdeltronics.wordpress.com/ until I installed some anti-spam measures and now they have all disappeared. In one month I will come to Thailand. I hope there will still be some durian left! I am a durian lover. The last time I was in Thailand I tried durian and sticky rice – very good! kru mod must try Malaysia durian , more tasty !! In the Philippines, Davao City is the Durian capital . You can smell the fruit as soon as you get off the plane. And speikang of planes, I believe durian is not allowed to be hand-carried. Some people can’t dig the smell. Not me though.